Fresno, Calif., the raisin capital of the world, produced a couple of fire-balling pitchers in the 1940s. The more famous of the two, Tom Seaver (born in 1944), won 311 major league games. Baseball writers voted him into the Hall of Fame on the first ballot. 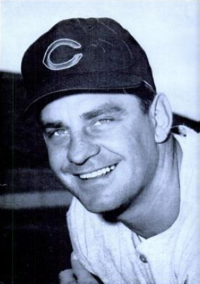 The other guy, Jim Maloney, enjoyed a 12-year career in the big leagues, almost all of it spent with the Cincinnati Reds. He topped the 200-strikeout mark four times and won at least 20 games twice. A hard thrower with a wild streak, Maloney was born in Fresno on June 2, 1940. His dad, Earl “Hands” Maloney played semi-pro ball on the west coast in the 1930s and later opened an auto dealership. Jim grew up as a star athlete. Most teams saw him as a future big-league shortstop. The Reds liked that strong arm and envisioned Maloney on the mound. 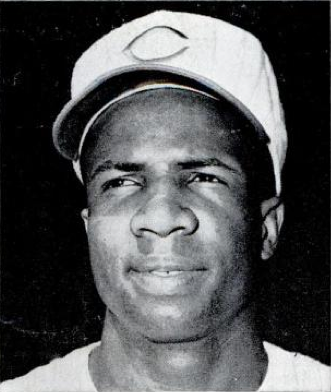 The right-hander signed with Cincinnati in 1959 for about $100,000. In July 1960, the Reds called him up to the big club. Over the next couple of years, Maloney did what he would do for much of his career. He struck out a lot of guys. He walked a lot of guys. And, he battled arm problems. Maloney threw as hard as anyone, 98 or 99 mph. But, could he stay healthy? And, could he ever harness that heat? Over his first two years with the Reds, he pitched 158.1 innings. He struck out 105 batters and walked 96. By 1962, more and more of Maloney’s pitches began to catch the strike zone. In 115 innings that season, he gave up 66 free passes, not great, but much better than in 1960-61. Maloney fanned 105. The pitcher’s big run began in 1963. He established himself as one of the top hurlers in baseball. Maloney went 23-7 for a Reds team that finished just 86-76 and in fifth place in the National League. Outfielders Vada Pinson (22 home runs, 106 RBI, .347 on-base percentage) and Frank Robinson (21, 91, .379) led the offense. Maloney posted a 2.77 ERA (120 ERA+) and struck out 265 batters in 250.1 innings. The new Cincinnati ace threw 13 complete games and six shutouts. He walked 88 and, just to keep batters from feeling too comfortable in the box, led the N.L. with 19 wild pitches. Tom Terrific, pitching for the Reds after all those great years with the New York Mets, tossed his one and only no-hitter on June 16, 1978, against the St. Louis Cardinals. 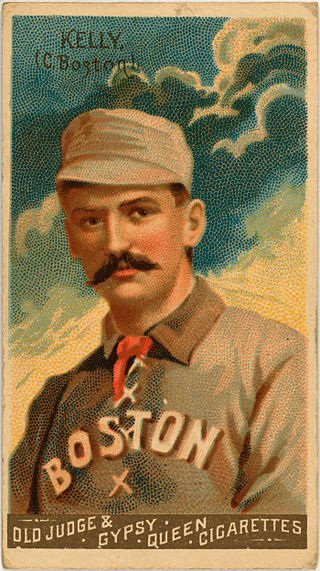 Maloney pitched two no-hitters in his career. He nearly threw three. On June 14, 1965, in front of fewer than 6,000 fans at Crosley Field in Cincinnati, Maloney struck out 18 and held the Mets scoreless for 10 innings. In the 11th inning, he gave up a lead-off solo home run to Johnny Lewis. Later in the inning, he surrendered a one-out single to Roy McMillan. Maloney’s first still-official no-hitter came a few months later. On Aug. 19, 1965, at Wrigley Field in Chicago, he held the Cubs hitless over—can you believe it?–10 innings. He struck out 12, walked an amazing 10 and supposedly threw 187 pitches. The Reds won 1-0 on a Leo Cardenas home run. The final no-no was a little easier. This one was back at Crosley Field, April 30, 1969, against the Houston Astros. The Reds scored once in the first, seven times in the fourth and twice in the eighth. Maloney walked five and struck out 13 as the Reds cruised to a 10-0 win in front of 3,898 fans. Maloney looked like he might be headed to the Hall of Fame. But, the arm woes never stopped. He complained about shoulder issues and elbow pain at various times. Management and many teammates got tired of hearing about it, even if it did come from someone as talented as Maloney. On-going salary disputes also made headlines. The flame-thrower crashed fast. He went from a 12-5 season in 1969 with a 2.77 ERA to a 0-1 year in 1970, with an 11.34 ERA over just 16.2 innings. In his second start that year, Maloney ruptured his Achilles tendon. He worked hard to make it back to the team by September, but his Cincinnati career was nearly over. Maloney was even left off the team’s postseason roster. The Reds traded their former ace to the California Angels in the offseason. There wasn’t any Hollywood comeback story, though. Maloney pitched in 13 games and went 0-3. He finished his career with a 134-84 record and fired 30 shutouts. Following his playing days, Maloney battled alcoholism and later directed the Alcohol and Drug Abuse Council in his native Fresno. He still lives in Fresno today. What more can you say about Jim Maloney? Well, there’s this: He faced the great Willie Mays a total of 66 times. The Say-Hey Kid batted .172 lifetime against Fresno’s other fireballer. Johnny Bench began practicing his autograph while still a grade-school kid in Oklahoma. He was sure baseball fans would one day clamor for that very signature. Ted and Katy Bench raised a ballplayer. More specifically, they raised a catcher. Ted Bench organized a boys’ team in Binger (pop. 700 or so), located an hour outside of Oklahoma City, when little Johnny was six. The prodigy took his spot behind home plate. Big-league teams need good catchers, Ted said to his son. Young Johnny Bench, born Dec. 7, 1947, told everyone and wrote it down on every school paper he could: Someday, he’d be a major-league baseball player. Count on it. He never lacked for confidence. The neighborhood dads watched Johnny fire off his mask to catch pop-ups and hurl fastballs from home plate to second base. This kid is a future big-leaguer, they said with admiration. Yes, he is, Ted agreed. Bench played a couple of more seasons in the minors and won Player of the Year honors in 1966 for the Peninsula Greys of the Single-A Carolina League. Cincinnati promoted Bench to the big club in August of 1967. Cincy traded two-time Gold Glove winner Johnny Edwards (only 29 years old) to the Houston Astros as a way to make room for Bench. The young player responded. Bench caught 154 games and was named the National League Rookie of the Year. He also won the first of his 10 Gold Gloves. Pitchers loved the way Bench called a game and the way he framed the ball for umpires. Of course, everyone loved the way Bench threw. He flat-out shut down the running game during an area when teams liked to steal. Bench put together one of baseball’s all-time great careers. He led the National League in home runs (48) and RBI (148) in 1970 and won the MVP. Bench earned a second MVP two years later, topping all N.L. batters once again in homers (40) and RBI (125). Cincinnati, of course, is not the quite the metropolitan area of New York of L.A. Bench, though, transcended one of the game’s smallest markets. It helped that he played so many great teams. Bench batted in the middle of the order for the fabled Big Red Machine. He played alongside Pete Rose, Joe Morgan, Tony Perez, George Foster and Ken Griffey Sr. The Reds won six divisional titles, four pennants and two World Series with Bench. Off the field, Bench turned into a celebrity. He sang a few country tunes on the hit TV show Hee Haw, for instance, and took part in the Bob Hope USO tour of Vietnam in the winter of 1970-71. Supposedly, Bench and Hope became good friends and exchanged Christmas cards for years. He also did a turn on Mission: Impossible and hosted his own weekly TV show in Cincinnati. Bad knees and other ailments forced Bench to retire following the 1983 season. He was just 35 years old. Bench ended up with 389 career homers (327 as a catcher) to go with 1,376 RBI and a .267 batting average (.342 on-base percentage, .476 slugging percentage). Writers selected Bench for the Hall of Fame on the first ballot, in 1989 with 96.42 percent of the vote. Carlton Fisk and Mike Piazza latter surpassed Bench’s home run mark for catchers. Bench still holds the record with 10 grand slams as a catcher. The great No. 5 was chosen for the Major League Baseball All-Century Team in 1999. His larger-than-life statue stands outside the Great American Ball Park in Cincinnati. For Reds fans, this catcher from little Binger, Okla., will always be bigger than life. The 1977 major league baseball season began Wednesday, April 6. No player had enjoyed a 50 home-run season since the great Willie Mays blasted 52 in 1965 for the San Francisco Giants. The 1977 major league baseball season ended Sunday, Oct. 2. Just a few days before that, on Wednesday, Sept. 28, the Cincinnati Reds’ George Foster cracked the 52nd and final homer of his glorious campaign, in the fifth inning off San Diego Padres starter John D’Acquisto. Foster topped his previous career-high mark in home runs, set the season before, by 23. He slammed 11 more round-trippers than runner-up Jeff Burroughs of the Atlanta Braves. Foster also led the National League in RBI (149), runs scored (121), total bases (388), extra-base hits (85), slugging percentage (.631) and OPS (1.013). The lithe, right-handed batter finished fourth in batting average (.320) and fourth in base hits (197). He led the Reds to an 88-74 won-loss record. The Big Red Machine, winners of the World Series in 1975 and ’76, finished in second-place, 10 games behind the Los Angeles Dodgers. To the surprise of almost no one, baseball writers awarded Foster the league’s MVP trophy. Foster’s strong wrists propelled him to stardom. He whipped a black bat through the hitting zone in record time. Foster usually hit clean-up in the stacked Cincinnati batting order, between Joe Morgan and Johnny Bench. Foster pounded baseballs for several seasons. It took a while for his career to get going, though. Still, he ended up with 10 seasons of hitting 20 or more home runs and seven seasons with at least 90 RBI. Born Dec. 1, 1948, in Tuscaloosa, Ala., Foster grew up in southern California. The Giants drafted him in the third round out of Leuzinger High School outside Los Angeles. He made his debut with the big club late in 1969 as a 20-year-old. The Giants liked Foster, but they didn’t have any place for him to play, with Mays, Bobby Bonds and Ken Henderson already starting in the outfield. The Giants finally solved the problem. They made a bad trade. 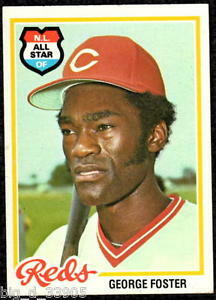 They shipped Foster to the Reds during the 1971 season for shortstop Frank Duffy and pitcher Vern Geishart. Clunk. In fairness to the San Francisco brass, Foster didn’t exactly turn into an immediate all-star in Cincinnati. He hit 10 homers and batted .234 in 104 games in ’71. Not until 1975 did Foster really get going. He hit 23 homers that season and batted .300 in 134 games. The following year, he smacked 29 and hit .306. Foster also led the N.L with 121 RBI as the Reds cruised to a second-straight world championship. Foster finished runner-up to Joe Morgan in the MVP race. In 1977, Foster already had pounded 29 homers by the All-Star break. He smashed three homers off the Atlanta Braves on July 14. The left-fielder recorded his 50th home run of the campaign on Sept. 23, off Atlanta’s Buzz Capra. At the time, Foster was just the 10th player to reach that mark. The writers again voted Foster as the N.L. MVP in 1978. This time, Fosted belted 40 homers, drove in 120 and hit .281 as the Reds once against finished in second place behind the Dodgers. Following two more solid seasons in a Reds uniform, Foster signed a five-year, $10 million deal with the New York Mets. (That was a big contact back then.) The Mets fans, though, quickly soured on their new prize. Foster hit just 13 home runs in 1982 as he tried to get acquainted with the Big Apple. He hit 28 the next year and 24 in 1984. It wasn’t enough. The New York fans never took to Foster. The team released him on Aug. 7, just a few months before it won a World Series. The Chicago White Sox claimed Foster on waivers but cut him after just 15 games. Foster left baseball with 348 lifetime home runs, 1,239 RBI and a .274 batting average. He never gained any traction for election to the Hall of Fame in Cooperstown, N.Y. He was elected into the Cincinnati Reds Hall of Fame in 2003. Ted Kluszewski led the National League with 49 home runs in 1954. Ted Kluszewski’s muscles needed room. The Cincinnati Reds first baseman packed plenty of meat onto those 15-inch biceps. Stepping into the batter’s box, the new-look Klu probably scared pitchers more than ever. He had those arms on full display. Just how hard can this guy swing a bat? As it turned out, Kluszewski hit far fewer home runs over his career (279) than guys like Mickey Mantle (536) and Jimmie Foxx (534). He did, however, enjoy a solid, if short, run as one of the game’s top sluggers. The 6-foot-2-inch, 225-pound former tight end at the University of Indiana, broke in with the Reds late in the 1947 season, a bit shy of his 23rd birthday. He enjoyed his first big year in 1950, ripping 25 homers and driving in 111 runs while batting .307. Klu’s home run total in 1951 dropped to 13; he hit just 16 the following season. Then, the left-handed hitter started to get it going. He crushed 40 home runs in 1953, drove in 108 and batted .316. Klu led the N.L. in home runs in 1954 (49) and also in RBI (141). He finished third in slugging percentage (.642) and third in OPS (1.049). Kluszewski bashed 47 round-trippers in 1955 (second in the league) and 35 more in ’56 (seventh). That year, he finished just behind Willie Mays in the MVP race. Klu averaged nearly 43 homers a season from 1953-36 and knocked home more than 100 runs each year. Unfortunately, the Cincy slugger suffered a slipped disk during the summer of ’56. He was never the same. Klu hit just 34 home runs over the final five seasons of his 15-year career. That included 15 in 1961 during his farewell tour with the Los Angeles Angels. Kluszewski retired with a .298 batting average. He topped the .300 mark eight times and hit a career-high .326 during that great ’54 campaign. The big guy rarely struck out. Klu fanned just 365 times in his career; his high mark was 40. He is the answer to this trivia question: Can you name the last three players to hit at least 40 home runs in a season and strike out 40 or fewer times? The answer–Ted Kluszewski (1953), Ted Kluszewski (1954) and Ted Kluszewski (1955). More than anything, though, baseball people knew Klu for his rippling biceps. Brooklyn Dodgers manager Leo Durocher once contended that his first baseman, Gil Hodges, was the strongest man in baseball. “What about Kluszewski?” a sportswriter asked. Michael “King” Kelly drank whiskey and hit line drives. He befriended bartenders and strangers. The son of Irish immigrants closed saloons and invented the hookslide. He swore off drinking a thousand times and led the National League in batting average twice. Kelly, born Dec. 31, 1857, grew up in Troy, N.Y., the son of Michael Sr. and Catherine, who had fled Ireland and that country’s terrible potato famine in the 1840s. The elder Kelly marched off in 1862 with a volunteer Union regiment out of Troy. Unscathed in war, he fell ill not long after the final battle had ended. Michael Sr. died in Patterson, N.J.; Catherine passed away a few years later. Young Michael took a job in a coal factory and began playing baseball on some of the top teams in Patterson, an early baseball hotbed. At age 15, he joined a team led by “Blondie” Purcell. That squad, featuring pitchers Jim McCormick and Edward Nolan (the “Only” Nolan, he was so good), dominated local clubs. Big-league scouts started looking at Kelly. The Cincinnati Red Stockings signed him to a deal. He enjoyed his first big year in 1879. Besides finishing third in the National League with a .348 batting average, he also ended up third in hits (120) and triples (12) and fourth in runs scored (78). Cincinnati didn’t enjoy quite the same success that Kelly did. The team lost thousands of dollars, and owner J. Wayne Neff let go of all his players. Kelly signed with the Chicago White Stockings, the forerunner of the Cubs. The man with the big, thick mustache and the shock of red hair spent the next seven seasons in Chicago. He led the league in runs scored three times and in doubles twice. In 1884, Kelly topped the N.L. with a .354 batting average. He topped the league again in 1886, this time with a .388 average. Now a superstar, the versatile Kelly played mostly catcher and in the outfield. He also helped out in the infield if needed. After losing to the St. Louis Browns (actually, the forerunner of the Cardinals, not the future A.L. club) of the American Association in the 1886 World Series, the White Stockings owners sold off some of their top players. 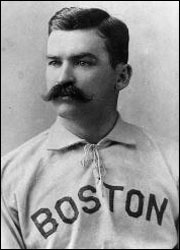 The Boston Beaneaters (forerunner of the Red Sox) hired Kelly to be player/manager. He was still a good player, he was Irish, and this was Boston. The affable Kelly stayed a Beaneater for three seasons, but he managed the team only during that initial campaign. He went from there to the Boston Reds (The Players League, 1890), then to the Cincinnati Kelly’s Killers (the American Association, 1891), back to the Boston Reds (1891), then back to the Beaneaters and (1891-92) and, finally, to the New York Giants (1893) before hanging it up. But, Kelly’s career was more interesting than those numbers. As mentioned, he supposedly came up with the feet-first hook slide to avoid being tagged out. He often “cut” bases, rounding them without actually touching them. Sometimes, he got away with the trickery, sometimes an attentive umpire called him out. According to some, while in the outfield, he’d stick an extra ball into his pocket. If a batter whacked a pitch over the fence, Kelly would take the ball from his pocket and swear that it was indeed the batted ball. While catching, Kelly liked to throw down his mask in front of the runner and prevent him from touching home plate. At bat, Kelly learned how to foul off pitch after pitch, wearing out the hurler and, he hoped, drawing a walk. Not only Kelly did excel on the field. He also performed on stage, touring with a vaudeville troupe in the offseason, often reciting the popular poem “Casey at the Bat.” The 1889 hit song “Slide, Kelly, Slide” proclaimed the ballplayer’s prowess on the bases and, much later, inspired a film short. Some experts call his book Play Ball, published in 1888, the first baseball autobiography. Kelly made a lot of money, and he spent it all. He liked people, people liked him, and, as they liked to say, “hey, bartender, the next round’s on me.” He couldn’t, or wouldn’t, stop drinking, no matter how many people pleaded with him. Kelly also liked to hang out at the track, and, hey, why not put down a bet or two? By time he retired, he was broke. “Mike was a friend to everyone except himself,” someone once said. Kelly was voted posthumously into the Hall of Fame in 1945.